Soar back in time half a century to 1968. That was the year Charles Einstein, having been enthralled by the publication of the classic Hi-Lo card count in Edward O. Thorp‘s epic guide to blackjack strategy, Beat the Dealer, went to work to perfect the original point-count system. That was the year the Einstein Count was born. He may have been a bit hasty in the promotion of this new counting method, though. It wasn’t long before a pair of mathematicians, Lance Humble and Carl Cooper—appreciating Charles’s ability to tweak Thorp’s system—decided to do a little point-perfecting of their own. What they came up with was an alternative count system that’s still in use today. We call it the Hi-Opt I Card Counting System. First things first, you’ll notice the Roman numeral in the name implies this is the first in a series of point-count systems. This is because (much like the Einstein Count it was born from) subsequent minds of greatness came along and tweaked this version, as well. There’s a Hi-Opt II Count you may want to learn more about. Being the more difficult of the two, I’d recommend starting with the easier Hi-Opt I before progressing to a more complex count, although for dedicated card counters, it will be worth your while, since it’s a bit more efficient and accurate in terms of betting and insurance correlation. As you can see, this is a balanced system. If you keep a running count through an entire deck of cards, start to finish, you should begin and end at 0. This makes it incredibly easy to practice at home for ease, accuracy and speed development. If you find this point-count system to be easy enough, it might be wise to add a side count of Aces. It’s not necessary, but doing so will further increase the efficiency in correlative betting. Being a balanced system, you’ll want to use the true count method to maximize its benefits. Converting a running count to a true count seems simple enough, but takes extensive practice to execute in live play. The idea is to divide the running count by the number of decks remaining in the shoe. If there are 6 decks, and the shoe is about 1/3 empty, we can safely estimate 4 decks remaining. If the running count is +4, divide by 4 to get a true count of +1. This example is a simple one, but more often than not, the result will be a decimal, so make sure you’re up for the task before bumbling your count in front of a live audience. 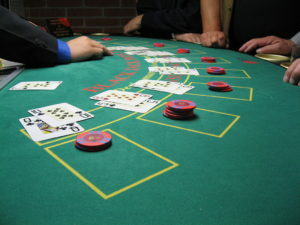 Executing the High Optimum card counting system works the same as any other. Increase your bets when the count is high (more high cards in the deck / better chance for blackjack) and decrease bets when the count is low (more low cards in the deck / less chance of being dealt a blackjack).